I am in this great Quilting Bee, Pieced Together, and this first month was Katie's month. She sent us her fabrics pre-cut and wanted us to do Improv. I had lots of fun doing this yesterday since it was my first time making a block for a Quilting Bee. I added some white and the green and white flower print , which Katy sent me along with her block that she made me in the Cottage Quilting Bee, needless to say I LOVED the print, thanks Katy! I had some really small pieces that I hope you can notice. I should have done more because I love the small pieces. Needless to say I had a lot of fun making this, so much that last night when I woke up for 2 hours during the night (who knows why) I was running ideas through my head of what I should do for my block for the Cottage Quilting Bee. I had not made myself a block and thought I should. This is what I came up with this morning. I love the little bird in the middle from Alexander Henry's Starling. I love his stuff. Now this is not at all what I imagined last night at 4 in the morning, but I like it. I tried to have as many small pieces as I could because those are my favorite. 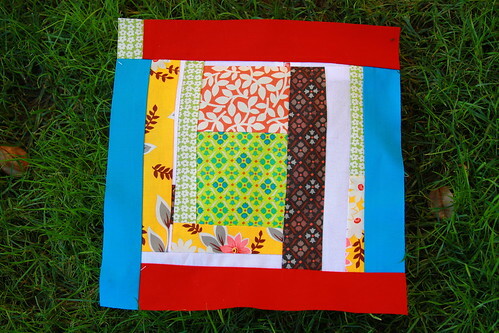 This really got me into the sewing mode, but I promised myself not to start anything new until I get all of my squares back from the Cottage Quilting Bee and make that quilt first! I will try to be good, but I really want to make some more blocks. 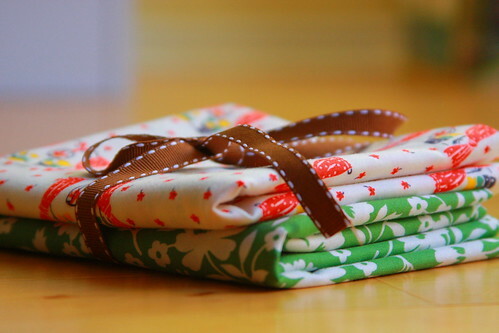 I went and mailed my FQ's today to Victoria, I sent along some extra scraps in her favorite color. I hope she like's them. Ooh, I like! I especially like your Cottage block - lots of fun! 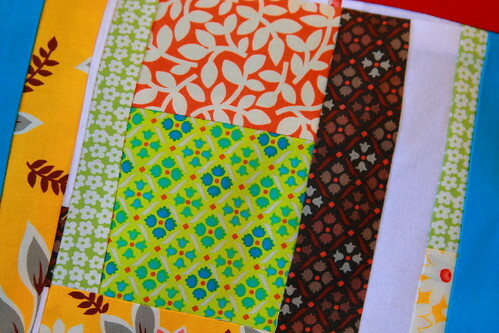 Aren't these quilting bees fun!? Its such a great way to connect with people and try new things. The blocks for your month in January look great! you did a great job on both of them. and again, i can't wait to see you piece your blocks together!!! those are some fun fat quarters victoria is getting!!! The blocks are great. I love some of those fabrics! I wake up like that too, better to think of sewing than how much money you spend on sewing! 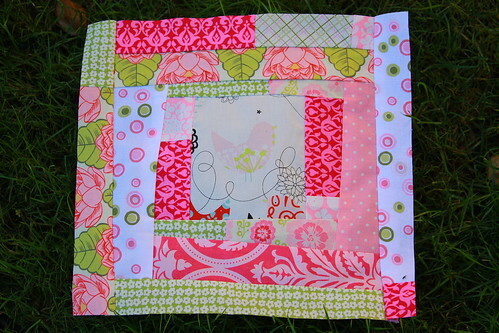 I love that pink block you put together in your mind in the middle of the night...pink and green are so sweet together! Great job. I love your block! I love the starling fabric in the middle. I am getting all of your blocks together and will mail them off as soon as I get Natasha's in the mail from Germany. Ashley Ann from Most Hot Butter will mail hers directly to you. This has been a great start to our bee. 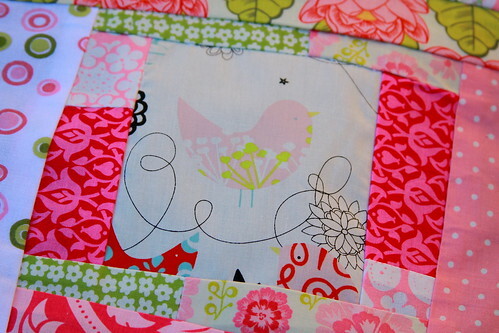 pretty blocks darci...love that ah starling fabric!! why is it that when I put a bunch of stuff like that together that it looks like a dogs breakfast and yours looks fabulous? It must be you're talented! I love the small bits and I'm happy to have discovered you blog! Great inspiration! Great blocks! I love the "Emily the Strange" one! You have an eye for blocks. Great color and pattern/print choices! Also- I wanted to say Thank you for a great FQ swap- I had fun! Let me know next time you're having a swap, I would love to join in the fun.